When I met Andrew almost in 2012, he had just moved to my boarding school from Bangkok, Thailand. I remember thinking he was joking because why on Earth would you leave a tropical destination to come to cold Long Island?! 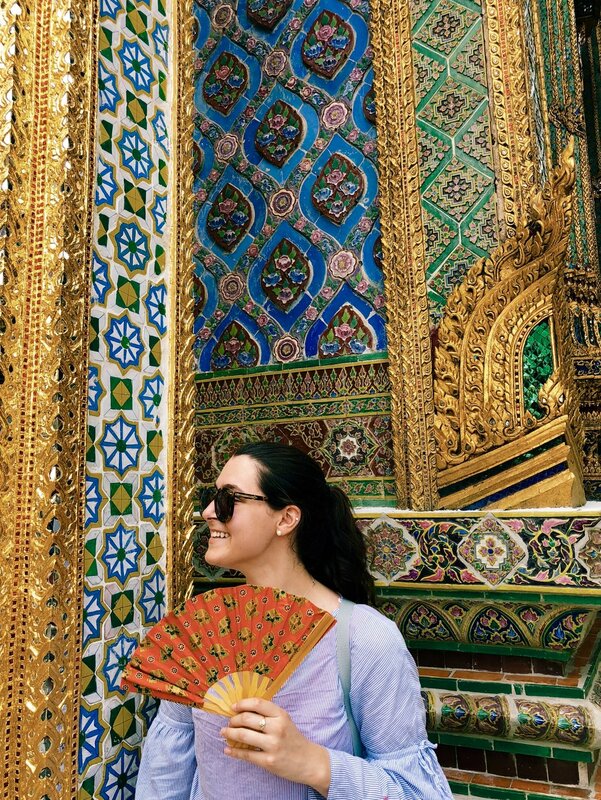 Ever since thenI have been dying to visit Thailand, so we figured before we start our "real world jobs," we'd make the trip over spring break! Bangkok is Hot, with a capital H. So Hot that the second you step outside after taking a shower you'll be drenched in sweat. You just have to go with it. Don't bother bringing any long sleeves or pants because I didn't wear any of them! Our AirBnB felt a lot like a hotel and is actually run by a company that rents beautiful homes all around Thailand. It was immaculately clean and super quiet. You'd never know anyone else was in the complex. It's located across the street from the International School in the city so it's incredibly safe and lots of expats in the neighborhood. If you haven't signed up for AirBnB, I couldn't recommend it more! It's the key to traveling on a budget and maximizing your trip financially. You don't have to worry about negotiating in Thai or being ripped off! Our wonderful guide Ms. Mee has lived in Thailand her whole life and knows the appropriate costs for everything. If you're obviously tourists, like we were, you will more than likely be ripped off. Ms. Mee also took care of paying for everything all day and we just had to pay at the end which made our experience much more relaxing! You have a local to guide you when you it comes to cultural norms. The Royal Palace is very strict and women must be completely covered. Ms. Mee knew this ahead of time so we could prepare. Your guide will take you on local transportation that you couldn't possibly figure out on your own. We got to take local commuter boats through the city and you have to understand the process or you'll be very lost, risk falling into a highly polluted canal, and make several others late for work! Your guide will know where the safest places are to eat in the city. You don't want to end up spending your entire trip sick, so trust that your guide knows when it's safe to eat from food trucks or other local restaurants. If you visit Thailand, you must request Ms. Mee from Thai Tour Guide. She was an absolute pleasure to spend the day with and we were so sad to say goodbye! This is the commuter boat through Bangkok! It stops briefly to let passengers on and then a man walks along the side of the boat as its zipping through the canal way. It costs .30 USD to ride! This is one of the most extensive flower markets I've ever seen and the prices were unbelievable. You could buy a dozen of roses for less than $5 USD. It made me realize how over priced everything is in the U.S. If we were there longer I would've bought a bunch and filled our AirBnB! Jim Thompson was an American who moved to Thailand to start the Thai Silk Company Limited in 1948. He fell in love with the Thai culture and built a beautiful home that still exists today. He tragically went missing in the Cameron Highlands, Malaysia in 1967. Today you can view his home where he designed an incredibly innovative house for his time and collected art from around Asia. Thinking about Jim Thompson and his brief but very successful life, I was reminded of the importance of reaching past the level of comfortability. It was very rare for Americans to uproot and move to Asia to pursue a new business. Thompson did this and evidently put his full heart into making Thailand his new home. He is very well respected by the Thai because he respected traditional artwork and wanted to share his joy for it with others. These monkeys can be found guarding most entrances to temples or homes. Talk about home security! The detail and color of the temples in the Royal Palace are incredible. This kind of elaborate decoration can be found all throughout the city. Many of the temples are decorated with broken pieces of mosaic. The Thai didn't want to waste the ceramic when they arrived broken from China, so they decided to repurpose them! I really admire their creativity & usefulness. Another special part of this trip was driving out to Chang Wat where the International School of Bangkok is. Andrew attended part of high school here and we got to see his old classrooms, neighborhood, and most importantly the basketball court where he spent a lot of time. The compound where the school and residential neighborhoods are located is gorgeous and I was so jealous that he had the chance to live in Thailand! When Andrew and I started dating, he was still living in Thailand so there were many school breaks and summer vacations spent in Thailand when we had to Facetime. There were so many places I remember seeing over Facetime, so it was special that I got to see them in person. It was definitely one of those moments that I'll remember forever. Tuk-Tuk: This is definitely the most fun way to get around Bangkok and you absolutely can't come without riding in one. They also tend to be more expensive. Make sure you decide on a price for the trip before you go because they will once again try to take advantage of you as a tourist! Taxis: They are extremely cheap to get around, but also be sure to decide on a price before you go. Often times they'll pull some ridiculously high price out of the air. Uber: Yes, it's everywhere and very trusty in Thailand. If you're just looking to have the reassurance of getting to a place on time, Uber is a great option.